I’d already been tipped off that Dragonfly had been voted the best reflexology massage in Shanghai, so after my disappointment at The Banyan Tree and Kanjung Massage Centre (and the fact that after my experience at Kanjung I couldn’t have my back touched!) I stepped next door with my fingers crossed and ordered their 90 minute reflexology massage. As my stomach was still bouncing around I was glad to find that their bathrooms were beautiful, but a little bit worried about whether I’d be able to stay sat in a chair for 90 minutes. Although the treatment room was very small, the chair was huge, and extremely comfortable (I’ve had worse hotel rooms). Not only did the 90 minute massage leave me feeling completely relaxed and revived, it also had the therapeutic effect of calming down my stomach problems, so it is highly, highly recommended. 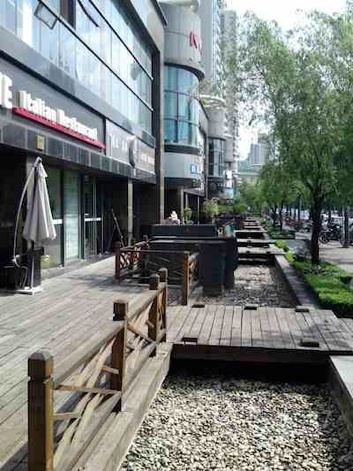 Dagu Road, Shanghai - or what I call Spa Road - take your pick!